With the number of supertalls on the Manhattan skyline doubling within the past year, it is easy to forget about impending proposals not yet out of the ground. 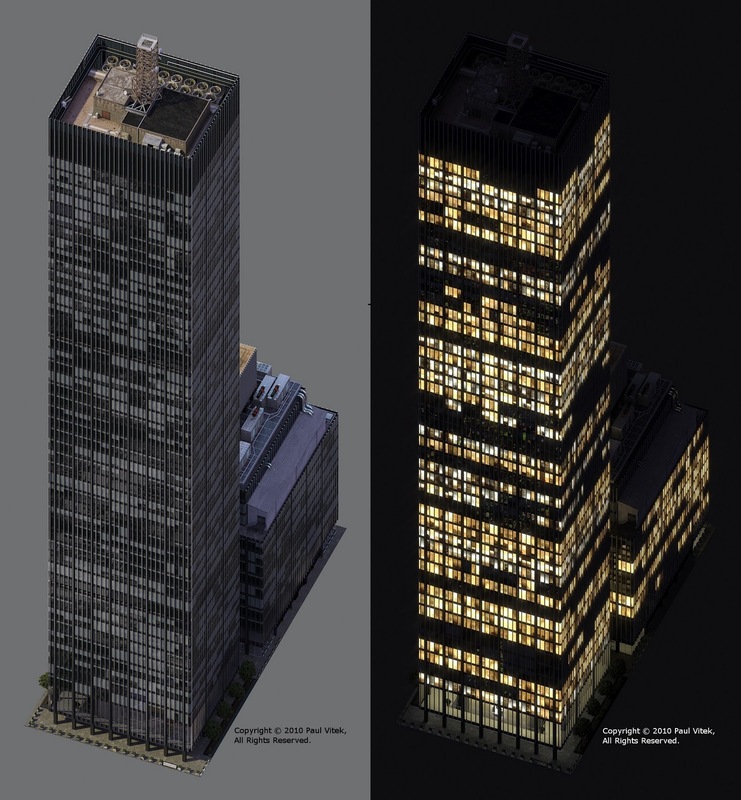 But now, the second supertall to result from the Midtown East rezoning is moving forward, with JPMorgan Chase filing a text amendment with City Planning for a 1,400-foot tower on the site of 270 Park Avenue. Designed by Foster + Partners Architects, the plans also come with the first renderings of the 2.4 million square foot supertall, and massing diagrams that offer a look at what’s in store for New York City’s most central business district. The plans include two options, showing what is possible without the text amendment, and what could occur with its adoption. The without-action tower would stand a whopping 1,566’8″ to its rooftop, becoming the tallest tower in the city by roof height, surpassing Central Park Tower’s imminent pinnacle 1,550 feet above street level. But the with-action version, which is what JPMorgan wants to actually build, would top out 1,400 feet above street level. Either option would make a very substantial impact on the Midtown East skyline. One Vanderbilt will stand 1,401 feet to its rooftop, but a very large portion of the tower’s uppermost profile above the 1,000 foot mark will be either glass or spire. 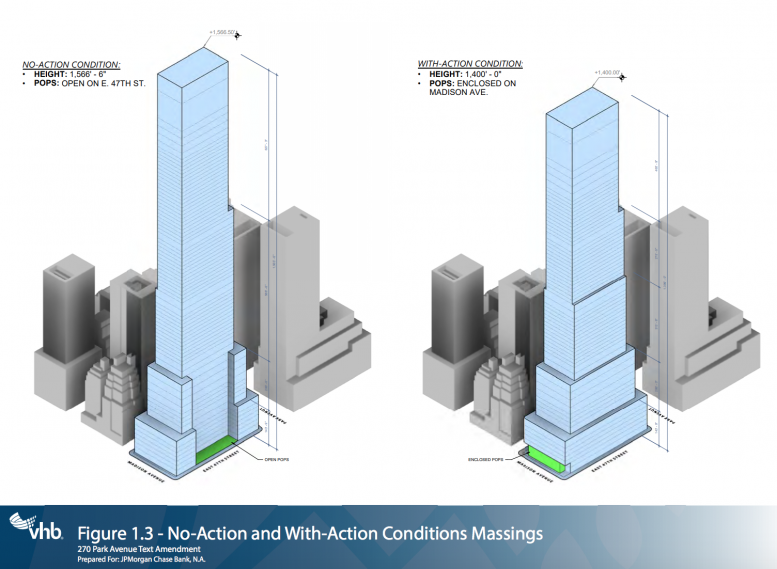 In 270 Park Avenue’s case, the with-action options shows a solid vertical profile all the way to 1,400 feet, promising what could become the City’s most prominent massing at such a height. The proposal also comes with renderings of the street frontage for both possibilities. The options aren’t too revealing, but they do show a frontage lined in metal and glass that is somewhat reminiscent of Foster + Partners’ plans for 425 Park Avenue, about a dozen blocks to the north, which recently reached the top of its superstructure. Beyond height, the primary difference between the with-and-without action plans is the inclusion of the building’s public space inside the tower, as opposed to leaving it outdoors. The indoor with-action condition would yield a 7,000 square foot public space co-located with retail options. The without-action condition would create a 10,000 square foot outdoor space. Inside, the with-action condition would result in a total scope of 2,420,609 square feet, a 1,232 square foot increase over what could be build otherwise. That difference is entirely attributable to the indoor public space, which would technically increase the tower’s size by 7,000 square feet, and consequently its office component would shrink by 5,768 square feet, to 2,348,490 square feet. The retail and cellar spaces would remain unchanged in size, totaling 6,475 square feet and 58,644 square feet, respectively. After review, the City has already found the change would not result in any negative environmental impacts. The existing building at 270 Park Avenue is occupied by JPMorgan Chase and was designed in 1957, and completed in 1961. The architect is Natalie Blois of Skidmore Owings & Merrill, LLP, and it was most recently fully renovated to LEED-Platinum status in 2012. However, that was prior to the Midtown East rezoning’s unlocking of the site’s newfound potential. 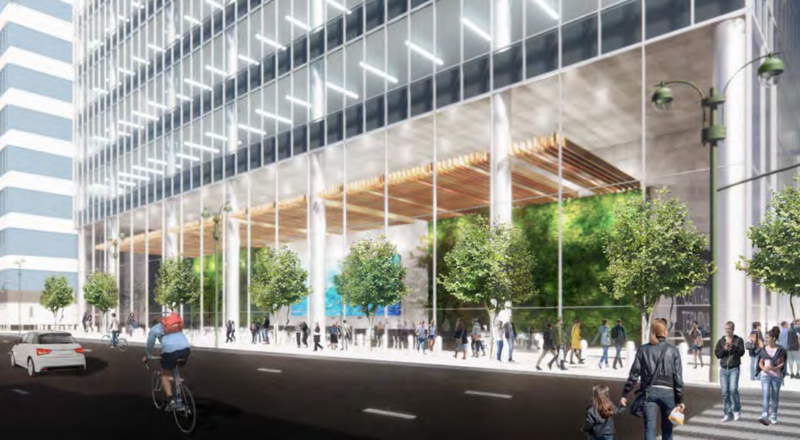 Demolition of the extant structure is expected to be complete by 2020, and JPMorgan Chase is aiming to have their new headquarters finished in 2024. 21 Comments on "270 Park Avenue’s Replacement Will Rise 1,400 Feet in Midtown East, Manhattan"
They need the amendment because the ‘as of right’ plan includes the “normal” plaza bonus. The with-action plan has a smaller plaza (7,000 square feet), but it is inside, so the EAS negative declaration (saying the amendment was fine) was positive, as the indoor amenities outweigh the loss of 3,000 square feet of plaza space (it is “unique). The height is just another bargaining chip (i.e. they will go to 1,400 instead of 1,567 if they get what they want re: plaza, they could probably go to 1,567 in both cases but an illusion of give and take is usually necessary for approval). Please pardon me for using your space: Intention, aim and purpose I know it. Goal, destination and target also I know it. Wow, this would be super tower. Especially if you see as all supertall office tower in the city are in fact have huge glass addition or spires. Including One WTC, 30 Hudson Yards, One Vanderbilt, while these towers are compete with roof height of this New Chase Tower on 270 Park Avenue, at 1368′, 1337′ and 1401′, however their top floors are much lower, even residential 432 Park, 1396 feet, have top floor ending at 1278′ the rest are tower’s mechanical, similar stories for other 1300 foot up 1550 foot supertall towers. I may suggest now we start call all towers what’s standing more than 1300 feet high as “NYNextGen” Supertall, since we will have also add 1438 feet tall 111 west 57 st, and 1550 feet tall Central Park Tower. This will be 7 towers total, all over 1300 feet tall. And no other city in NA have any similarities, neither Chicago or Toronto. Who are may compete with numbers of new skyscrapers built and under construction with NYC. But anyway NYC have a record numbers are supertall built and under construction besides these seven, they are 9 Decals, ESB, Chrysler Building, 35 Hudson Yards, 50 Hudson Yards, Spiral Tower of Hudson Yards Blvd, 401 Ninth Avenue, 3 WTC, 2 WTC. The planned 2 WTC will join 1300′ tall group of these supertall, and if Penn Hotel replacement proposed supertall will get it’s light at last height of 1232 feet, than we will get 17 supertall towers in NY, this more than list of skyscrapers taller than 600 feet in Los Angeles!!! From my perspective the indoor plaza and the reduction in commercial space (height) are both negatives. The without action plan is better. My previous comment didn’t include planned or skyscraper under construction in Los Angeles, with that current numbers of LA skyscrapers taller than 600 feet are 17 now, and about the same amount planned and under construction there, in LA. However this is 600′ taller not 984′ and up. From these total 34-35 buildings only 5-6 will be exceed 984 feet height. And oops, I forgot include one planned LES supertall skyscraper next to 850 feet tall One Manhattan Square, and 45 Broad, 1,068 feet, similar height for 9 Decalb, so NYC will get total 22 supertall, 7 of them are more than 1,300 feet. This include all existing supertall building including One57, 53W53, ESB and Chrysler. Also, ESB with antenna will be 1454 feet NextGen supertall and 4 Times Square with antenna will be about 1100 feet. This conclude our list of supertall at straight two dozen!!! However, I won’t be sad in LPC will declare this building as Landmark and JP Morgan Chase will think built their new HQ in place of 2 WTC using older design!!! I won’t be sad if LPC, my mistake. When One Vanderbilt will finish do we really need another supertall at similar height few hundred feet away. I would leave as is, make existing 270 Park a landmark status as midcentury classical corporate design and move Chase HQ to site of stalled 2 WTC, for finishing 18 years old still not finished general plan to rebuilt WTC. And if 2 WTC will resume construction next year, have already built foundation, top out of 2 WTC will be by 9/11/21, or at 20th anniversary. Destroying that mid-century SOM building that was just renovated is ridiculous. It’s wasteful and unnecessary. NYC zoning regulations need a serious revision where preservation, efficiency and growth are of equal weight. I just don’t get the appeal of the current 270 Park for some people. This rush to landmark mediocrity…its just a 700ft black box, tear it down. Chase does not want to move downtown they want a new bigger more modern building in the heart of midtown. Build the 1500 ft building! This is an excellent location for a supertall, but it’s a huge environmental waste to bring down a 700-foot skyscraper. There were no other blocks available? Why we need another glassy twice taller replacing this glass building. “Outdated” and not “too tall”, come on, 700 feet about is pretty tall still in America. And for supertall lowers the total numbers of supertall in pipeline is about 15, all taller than 984 feet up to 1550′, we cannot built more than 1776 feet tall as per respect letting OneWTC tower stand as taller building in United States, as to honor for almost 3,000 death in 9/11. We can live and breathe well without building over the height of OneWTC, same as our National Capital can’t built buildings over the height of US Capitol Building, exception only for Washington Natiinal Monument who is above 520 feet. However this is not a building, but observation tower and obelisk!!! My personal opinion why Chase cannot come to Downtown and use either of two design for 1378 to 1442 feet tall WTC Tower 2, what is stalled after finishing foundation and all below the ground floor(s). And leave this black granite covered monolith as a symbol of Corporate America, her International Style of Afterwar Corporate Skyscrapers, even right now 700 feet is no longer feeling “tall building”, but since what!? LPC of NY must give 270 Park NYC historical landmark status. And preserve it same way as nearby Seagram Building or Lever House. Raising down 270 Park will create a precedent and as a result we may lose 1251 Sixth Avenue, or other Midcentury Corporate Granite covered monolith, just because they are not “too tall”!!! I’d like to see a new 2 WTC built that is taller than the old one there,and note that other buildings starting with 432 Park are already taller than the real height of 1 WTC (1,362 feet roof,1,368 feet rooftop structure).The city whose buildings stop growing taller is a city that is dying.When people come to their senses over the disgraceful WTC Memorial we can build MUCH taller new buildings in the empty holes currently screaming surrender to Al Qaeda. I absolutely applaud and welcome this plan for a taller new 270 Park.I agree that the 1,566-foot option sounds better than the 1,400…and landmarking the current 270 Park is ridiculous,it is a prime example of the kind of building that owes its existence to not wanting to keep old buildings and should perish by the same justification that created it.Let Seagram and Lever be the token landmarked representatives of that generation as we move upward into the sky. I WORKED AT 270 PARK AVENUE FOR UNION CARBIDE FROM 1969 TO 1982 WHEN THE BUILDING WAS SOLD TO CHASE AND THOUGHT THE BUILDING LOOKED GREAT BEFORE CHASE CHANGED THE COLOR IN THE LOBBY. THINK THE BUILDING LOOKS GREAT JUST THE WAY IT IS. WHAT A WASTE OF MONEY. I THINK THAT 27O PARK IS THE NICEST LOOKING BUILDING ON PARK AVENUE. As a midtown resident for 28 years and UWS before that, I’m sad to see my city’s sunlight disappear into permanent shadow caused by absurdly high buildings in our mayor’s desperate quest to have us become Shanghai. We have lost the historic grace our skyline had not so long ago. And as to “no environmental impact”, how about the impending thousands more people daily fraying our fragile infrastructure of transportation, water and power? So so wasteful. Shame on Chase.